Our firm was founded by Partner, Christine C. Mastin in 2003 as Mastin Law Firm, P.C. After building a successful immigration law practice with a major Denver law firm, Ms. Mastin left to establish her own law firm and achieve a stronger work-family balance. Through the transition, she cultivated the ability to provide her clients with greater flexibility and focus with regard to her services. Charles L. Mastin II, joined the firm in 2006 after serving as a Shareholder at another reputable Denver law firm. 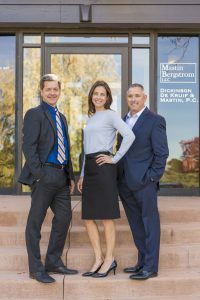 With his addition, the firm expanded its services to include the representation of businesses and individuals in various business transactions, including Mr. Mastin’s extensive representation of dentists in the formation, acquisition, sales, and dissolution of dental practice groups, and his representation of businesses and individuals in tax matters and tax filing preparation. The firm expanded its practice areas when Jeff Bergstrom joined the firm as Partner in 2012. His expertise in real estate, tax, and business law expanded the services our firm offers clients. Mr. Bergstrom leads and directs our Real Estate practice. We pride ourselves on our ability to provide large-firm experience in an efficient, small-firm setting. Our team’s range of experience places the firm in a unique position when it comes to client service.